28 Inch TITAN Vinyl Cutter Professional Sign Maker + Free Design/Cut Software. 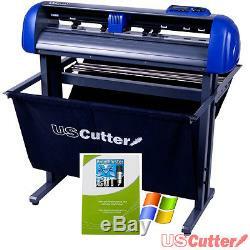 USCutter TITAN Vinyl Cutter - 28 w/Vinyl Master Cut. PLEASE NOTE: Although TITAN is compatible with Mac, the Vinyl Master Cut software that comes with it is NOT. USCutter is proud to present the TITAN vinyl cutter series as a high quality and affordable choice for professional sign makers and do-it yourself vinyl cutting enthusiasts. The TITAN cutter series is offered in 15, 28 and 53 inch models capable of a max cut length of 240 inches. With it's variable speed and cutting force, the TITAN is perfectly suited for cutting a variety of material including adhesive vinyl, window film, hard paperboard, sandblast stencil, mask material and much more. Laser registration for contour cutting function. True USB send files directly to the cutter from Adobe software and other applications that support Vector Graphics. Aluminum alloy construction, precision ABS sides. Mac & PC compatible USB and RS-232 connection. Large LCD display & control panel for adjusting speed and cutting force. Stepper motor for reliable performance. Plug and Play - simple installation. Cuts adhesive vinyl, heat transfer vinyl, cardstock, paint mask stencil, laminate, sandblast mask & low intensive reflective material. Floor Stand & Material Basket with 28 and 53 Models. Design and Cut Professional Software: VinylMaster Cut PC Only. Mac users should check USCutter website for alternative. 3 TITAN Blades, (1x60° , 1x45° & 1x30° blade). Pen Holder (use to plot instead of cut). The TITAN 2 servo motor is quieter and more efficient than a comparable stepper motor which is part of what makes the TITAN 2 a professionals vinyl cutter. Servo motors are faster and more accurate but require more complex drive circuitry and positional feedback. In addition to the back lit LCD, the TITAN 2 features illuminated buttons for easier reading. The TITAN 2 servo motor makes it faster, quieter, more accurate and able to cut thicker material. Contour cutting is simple with the included VinylMaster Cut software and laser registration mark reading. The illuminated LCD screen and large control panel buttons makes programming the TITAN vinyl cutter a breeze. Adjustable speed and force is available by the touch of a button which makes for ease of operation. The digital readout makes for accurate and precise settings. USCutter TITAN vinyl cutters are constructed to withstand rigorous use and are built tough from the inside out. From the aluminum alloy frame and ABS end caps to the double ball bearing blade holders, the TITAN is built to last. MAC and Windows compatible with built in USB interface, the TITAN machines are a plug-n-play users fix. TITAN cutters offer a true USB - a feature usually offered only on cutters costing many hundreds or even thousands of dollars more. Send files directly to your TITAN cutter directly from VinylMaster Cut, Sure Cuts A Lot or other vinyl cutting software. Don't bother with a keyspan adapter.. You won't need it. Customer Review from Signman 3760 in TN. Contour Cutting with VinylMaster Cut and Stepper Motor. VinylMaster Cut - Contour Cut & Design Software PC Compatible. VinylMaster Cut (Basic Edition) is dedicated vinyl cutting software designed specifically for making vinyl signage. VinylMaster Cut allows you to produce a wide range of vinyl lettering, pinstriping, and general signage, and comes with a suite of text, curve, and object tools. Take your creative vision from your mind to ready to cut computer image file with an easily customizable and intuitive interface. Fonts are vectorized and ready to cut immediately. Edit images, draw shapes, customize text, modify signs, create logos, and so much more. VinylMaster Cut software is quite possibly the best vinyl cutting software on the market today. With built in vectorization tools, compatibility with all the major image formats, even low quality jpeg and bitmap images, VinylMaster Cut can quickly and easily turn a broad variety of images into cuttable vector path designs in seconds. Simply use the VinylMaster Cut image trace feature on any image and it will be converted into a plotting file ready to cut or make further edits. Add registration marks, print, and cut from 1 screen - with helpful prompts from the software wizard. VinylMaster Cut is equipped to provide precise contour cutting whether your machine works with LAPOS (Laser Positioning Sensor) for manual contour cutting or ARMS (Automatic Registration Mark Sensor) for automatic contour cutting. Contour cutting, cutting the outline around a printed image, is perfected with VinylMaster Cut for applications like stickers and custom printed labels. The GUI that VinylMaster Cut offers provides you with diagrams to preview and modify before completing your contour cuts. This preview will even assist you in loading your media into your cutter correctly. VinylMaster Cut has an advanced feature to allow for sensitivity control over your cutters optical eye when using the ARMS feature. This feature ensures that your registration marks can be read when cutting matte, gloss, laminated or even reflective material. Design and Image Editing Tools. VinylMaster Cut functionality includes text tools, curves, shapes, logos, drop shadows and more as well as the ability to import from AI, EPS and PDF files easily. In addition to the VinylMaster Cut variety of tools, 1000's of clip art samples, 1000's of corporate logos, and a large selection of road signs are also included. With dimension and layout tools, your design will be completed accurately while saving material from being wasted. Editing nodes, customizing and adjusting shapes, and welding and manipulating paths are all easy to use and reliable functions with VinylMaster Cut. For production runs of vinyl projects which require layering of multiple colors, VinylMaster Cut has an innovative spooling function which is much superior to the competition. Send multiple jobs to the queue and sort by color: only the parts of the design in the specified color will be cut, allowing you to complete multiple multi-layered multi-color workflows without switching between rolls of different colored vinyl. While cutting with VinylMaster Cut is limited to one user, use of the software is available to unlimited users. Your design team, digital printer and vinyl cutter specialist can all collaborate using one license and send the cutting file to the computer connected to your cutter when it's time to actually cut the job. This allows you to design and work from any location. Pentium processor-based PC or compatible computer (Windows). 512 MB of RAM or more. At least 50 MB of available hard disk space. USB Port 1.1 or 2. Activation Code included on card in product packaging for digital download of software. Internet Access is required for installation. Physical disc is not required. This software will work with the following cutters. USCutter Series MH, SC, Laserpoint II. USCutter Series Table Titan, Titan, Titan 2 & Titan 3. Graphtec CE Series, FC Series. ARMS contour cutting feature works only with vinyl cutters which are ARMS compatible. This vinyl cutter is not ARMS compatible. Blade holder, pen holder, 3x blades, USB & serial cable, spare fuse. Standard Vinyl, Heat Transfer, Card Stock, Paint Mask, Laminate, Sandblast Mask to 22mil, Low Intensity Reflective. 512K/4MB; CPU: 16bit MCU, 16MFlash. We start more auctions at 1 cent because we are confident that we can always offer the best price. We get the best pricing; you get the best value. Other's claim to be top sellers, but look at their feedback and see the truth! Community - We have a huge online forum where you can learn more and see how we are committed to improving our reputation through outstanding service and support. Software Choice - Most of our machines come with a SignBlazer Elements Trial Edition. The software is outstanding software that is easier to use and more capable than Flexi Starter. Reputation - We don't inflate our specifications. We just sell the best product for the lowest price. You have 30 days from the time you receive a product to initiate a return or to report a defective product. See the items below to determine the terms for your return. Any order placed with USCutter implies consent to abide by these policies. Full support will be given by USCutter representatives in the replacement of any parts sent. Any equipment older than 30 days may be replaced with a certified refurbished unit at our discretion. If an item arrives in an unusable condition, USCutter must be notified within 30 days of receiving the product or a return may not be allowed. Consumable Material: Vinyl, transfer tape, and other supplies are not eligible for return once the packaging is opened. Software: Software is not eligible for return under any circumstances. If the disc is determined to be defective a digital download for the item may be supplied at the discretion of USCutter. Local pickups are not available. We do sell products internationally and do our best to minimize problems but it is impossible to eliminate all potential issues and delays. National holidays do not count towards expected time of transit and should be calculated as an additional day of transit. The item "28 Inch TITAN Vinyl Cutter Professional Sign Maker + Free Design/Cut Software" is in sale since Monday, June 26, 2017. This item is in the category "Business & Industrial\Printing & Graphic Arts\Plotters, Wide Format Printing\Cutters- Wide Format". The seller is "uscutter" and is located in Memphis, TN. This item can be shipped to United States.